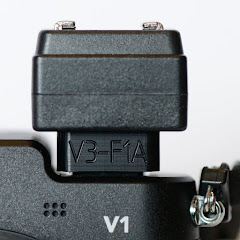 This blog is about the V3-F1A flash adapter for Nikon 1, the Nikon Z7 and the D800 as well as generic photography related issues. 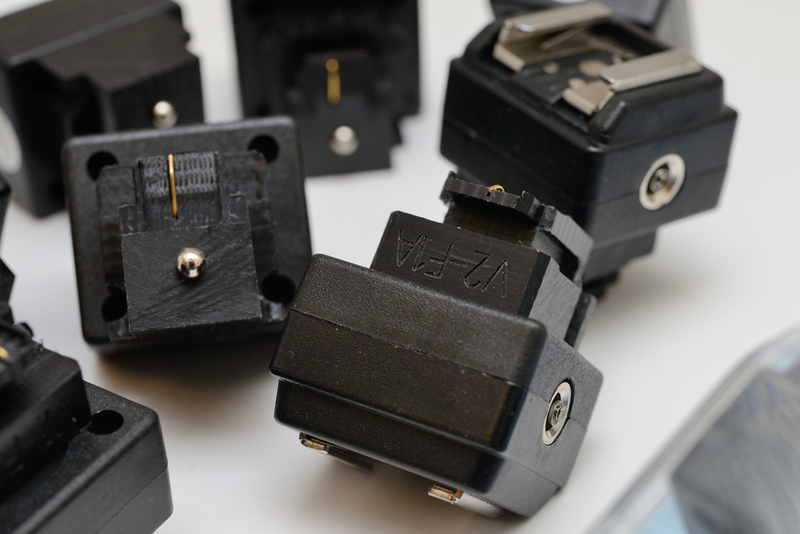 Currently I am making flash adapters to enable the Nikon 1 V1, V2 and V3 cameras to use standard flashes or radio triggers. This is a unique product, my own innovation, not available anywhere else. My own DIY CNC is another subject here. It was a long journey, but finally the adapter is now ready. My CNC project, a machine necessary to make the adapters, is almost done, but ready enough to enable me to use it to make the adapters again, in better quality than before. 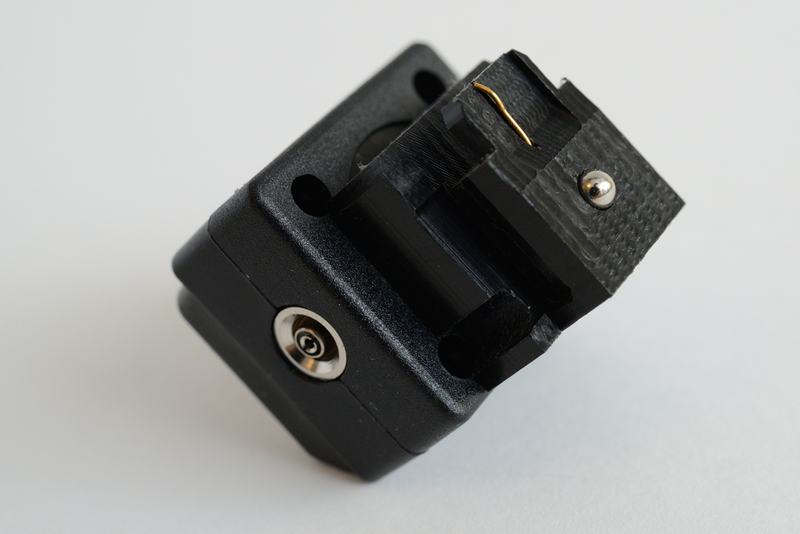 I will keep the manufacturing volume fairly low because this is only a hobby activity for me so I have no possibilities to build up a large stock, but never the less, the adapter is available now again. The new version does not look 100% identical to the V1-F1A, which is why I changed the name to V2-F1A. The design is changed to improve and eliminate the issues I had with the first version. The necessary changes does not mean change in functionality, only in looks. 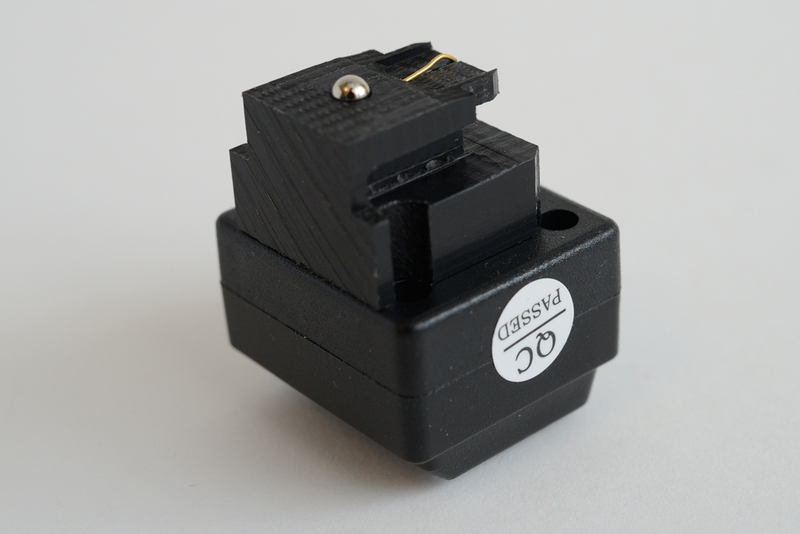 The major changes are that the white knob is gone and that there is a 'glide guide' at the sides of the contact surface to improve accuracy for the tiny contact pin which triggers the flash. 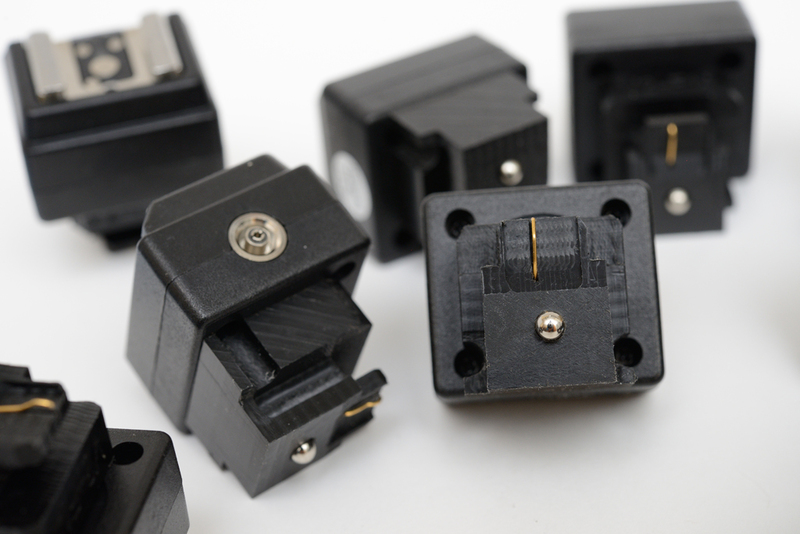 The contact surface is milled so that there is a slope which helps in guiding the contact, as well as the attaching of the adapter to the camera. 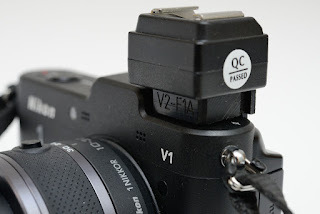 It also increases the stability of the adapter when the adapter is fitted to the camera. The white knob is gone for several reasons. 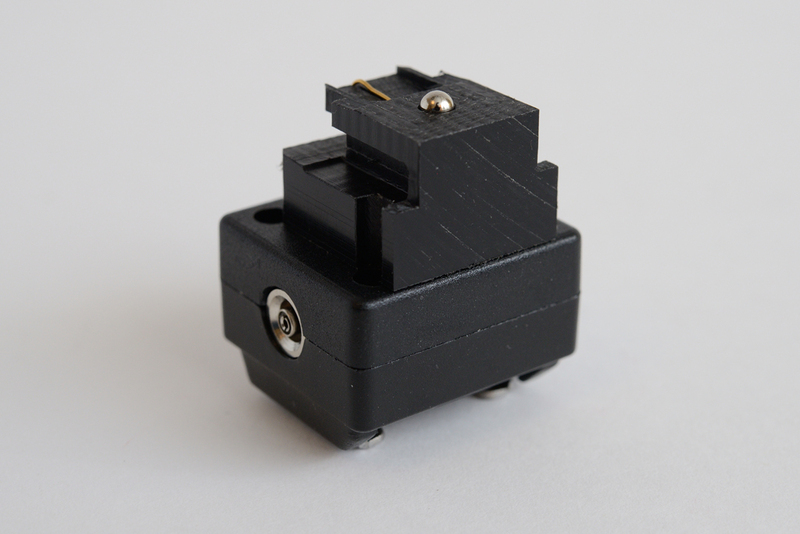 In V1-F1A the knob gave the impression of a proper locking mechanism, which it was not, it was just meant as a GND contact for the trigger. Now, in the new version that is solved with a spring loaded ball contact at the bottom, just like the center contact in any other, traditional flash. The V2 in the name of V2-F1A has nothing to do with the Nikon 1 V2 camera model, it is just a version indicator, V1-F1A was version 1 and V2-F1A is version 2 of the functionally same adapter. 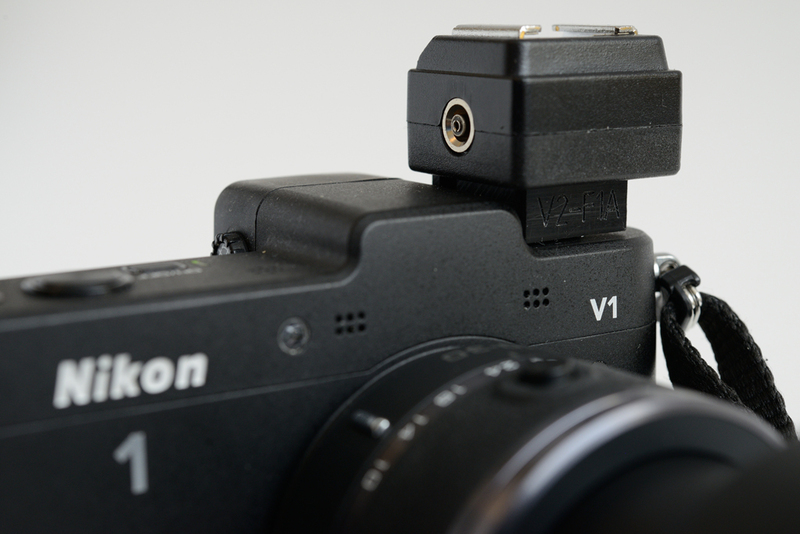 This adapter is designed to be used as a flash adapter on Nikon V1 (or equivalent) camera models. It will allow the user to attach a small standard flash unit with a maximum weight of 120 g (4.2 oz), including batteries. A cable or a radio trigger must be used if the user wishes to use heavier flashes. 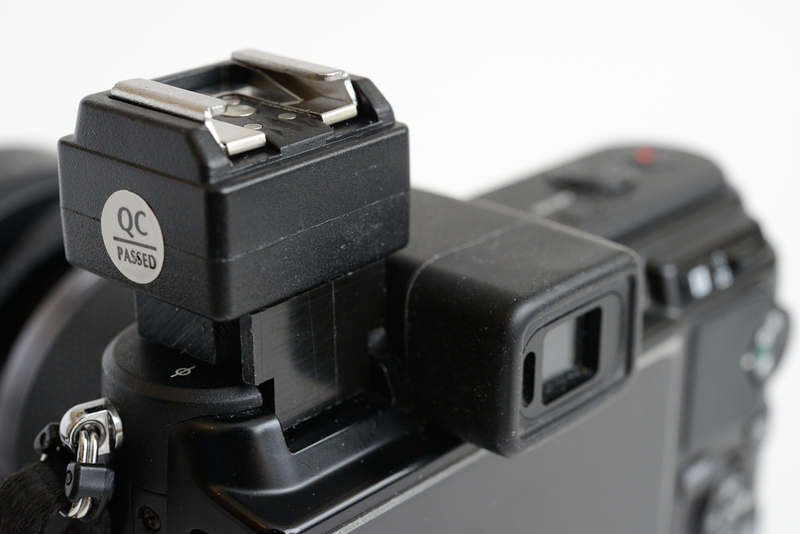 By not complying with this, the adapter or the camera may get damaged due to the weight and the forces involved. 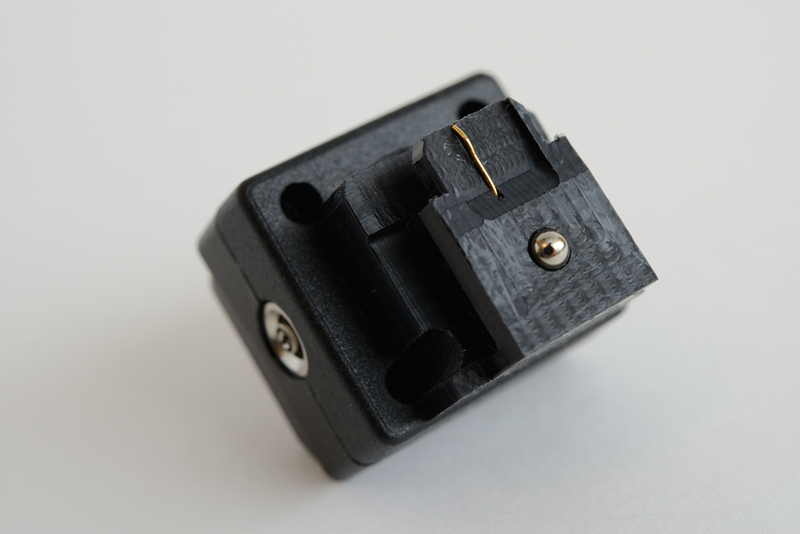 The hotshoe can be used to support a radio trigger. 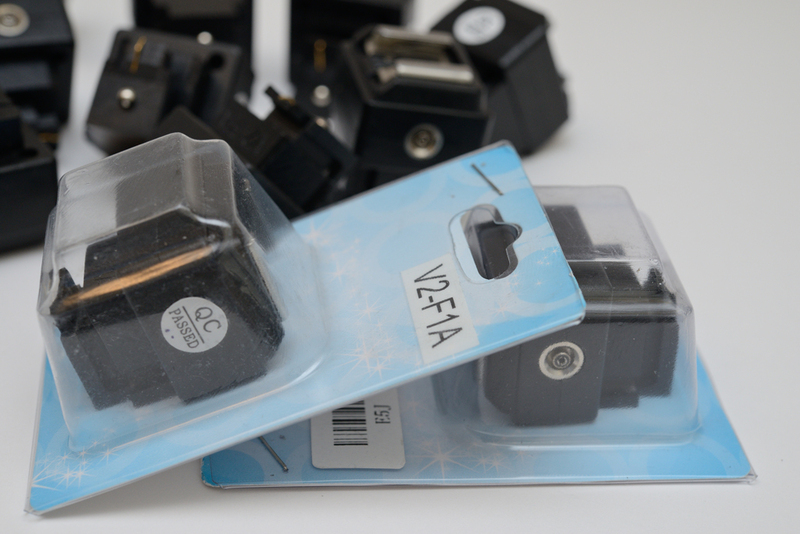 If you wish to trigger a heavier flash and don't have a radio trigger, you can use the PC contact on the side of the adapter to attach the flash to the adapter. TTL is not supported; you must use the flash in manual or in Auto mode if the flash you are using has that mode. 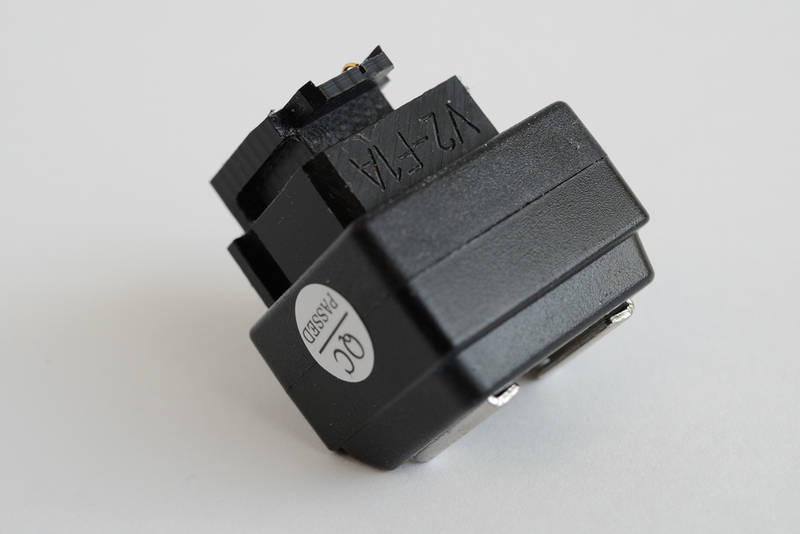 Most flashes, but far from all, have a thyristor automatic mode; check out the manual of your flash. As an example, the Nikon SB-300 and SB-400 don't have this mode, so they can only be used in full manual mode with this adapter. As another example, the Nikon SB900 has this mode and can be used with the adapter but still not in iTTL mode. 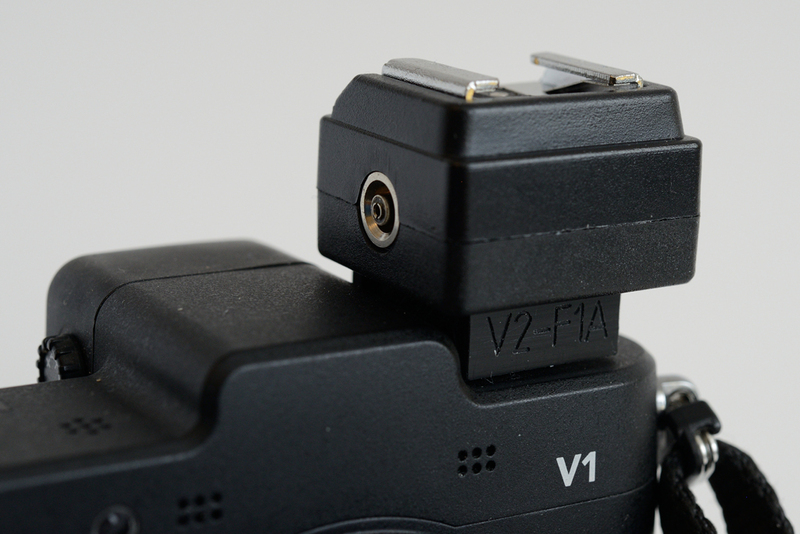 Use the V2-F1A only with flashes which are designed to be used on digital cameras. Don't take a chance with any old flash because you may cause irreparable damage to your camera, or in the best case, to the adapter. 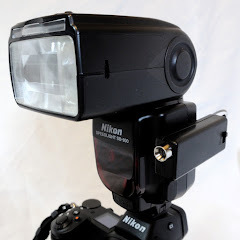 Old flashes can have several hundred Volts high trigger voltage, which would be directly hazardous on the Nikon 1 cameras, not only for the camera, but also for the users of the camera. These cameras are not made for those types of old flashes, so make sure you know your flash well. 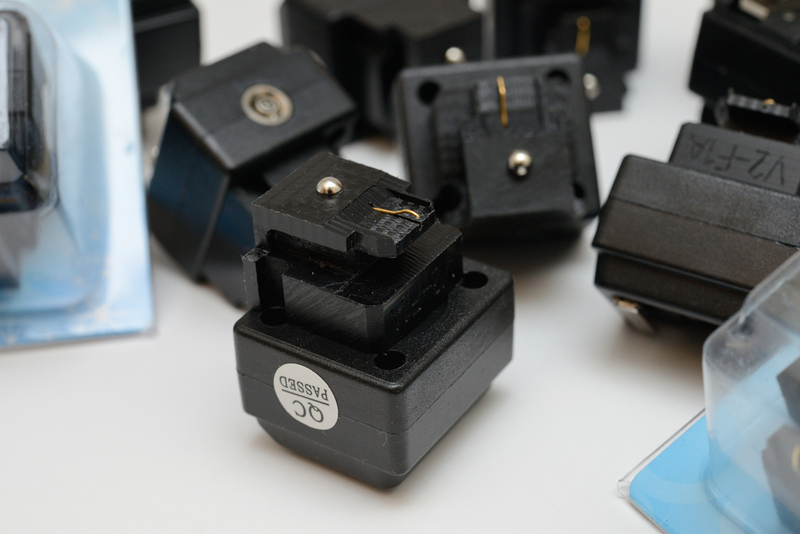 The adapter has a built in protection diode, but don't take chances, the protection diode is not a 100% warranty against far too high trigger voltages. I have previously written about how to measure trigger voltage in case you feel confident about doing it on you own, read this article before you start. If you are interested, please send me a mail using the contact information below. Please don't pay in advance before I confirmed that I have an adapter reserved for you. After I received payment, I will need one work day to pack it and to ship it to you, using registered, traceable post. I will use the Swedish Post and will charge you what they are charging me. Please note that I will only sell this unit to buyers from Australia, the Canada, USA, New Zealand, countries of European Union, Norway, Switzerland, Iceland, Liechtenstein, Jersey, Guernsey, Monaco, Aland, South Africa, Namibia, Botswana, Swaziland, Lesotho and Japan. Note that I make no exceptions made from this list. I accept payments in EUR, USD or SEK only, no other currency. Payments must be made through PayPal, no direct money transfer, checks or any other means are accepted. You are paying the PayPal fee, payments without the fee will not be accepted. Currently the PayPal fee is an additional 3.4% + a fixed small sum on top of of the total costs. Shipping and handling costs will be added, this cost is not possible for me to predict, I will charge you what the Swedish Post charges me, which at this moment is 13 EUR or 15 USD for shipments outside Sweden. I will ship with registered, traceable post only. The price for each unit is 84 EUR, 92 USD or 785 SEK, whichever you prefer. The price may change as exchange rates are changing. This price excludes the shipping and handling, the total price will be calculated when I have your personal data. Prices and the terms are non-negotiable, if you think this is not acceptable for you or you think the price is too high, please don't buy it. This is a do-it-yourself product. No warranty is given, other than that I guaranty I tested the flash adapter, not only before shipping it, but also during each stage the manufacturing process, and I guaranty that it is working on my Nikon V1 when I ship it. I have no possibilities to test it on the Nikon V2, V3 or any other future models since I only have the V1. Please note also that the manufacturing marks and scratches on the adapter are the results of DIY manufacturing using a CNC mill. The marks and scratches are not defects and will not affect the functionality. Remember also that a deal is a deal, if you bought it it is yours. I will NOT take it back, not even for a reduced price. This may sound harsh, but I have bad experience and this is the "lessons learned" from that experience. It is up to you to decide to buy it, and if the conditions are not acceptable, please don't buy this adapter. Apparently there are some false rumors created on the internet, at this moment I won't mention which site, saying that the latest firmware of Nikon 1 V1 camera, which is 1.40 at the moment, prevents the camera from triggering a non-Nikon flash. This "information" is a lie created by persons who have no clue, the adapter works fine even with the latest firmware. I keep my camera gear up to date to make sure I test everything with the firmware the equipment is recommended to be used with by Nikon. In other words, at this moment every firmware release works with this adapter and I honestly don't expect Nikon to ever create one which would stop this adapter from functioning on your camera, at least not until they start selling original Nikon flash adapters. Please note that the images are click-able. If you are interested in seeing more detail, just click on the images and larger ones will become visible for you. A powerful, generic auto focus assist light, which can be used on almost any camera with a built in auto focus assist light. Click on the image for more details. The V3-F1A generic flash adapter replaced the V2-F1A and is available now. Click on the image for more details. Is CNC stepper motion really smoother with UCCNC than with Mach3? Copyright (C) 2013 Adapting Camera, Sweden. Simple theme. Powered by Blogger.